Profoil’s copper foiling dies are manufactured onsite and made with advanced UV and chemical etching processors. Copper is suited to long run printing/foiling jobs as it’s the hardest of the three materials used. 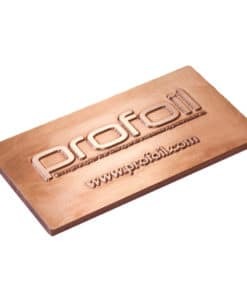 Copper material is also advisable for use on high detail foiling blocks where thin, complicated and/or over-lapping lines and small font type are present – where CNC brass dies won’t produce. Sold in 7mm, 6.35mm, 3mm and 1.63mm gauge sizes. If you order before 12pm, we will dispatch your dies within two working days. It is important that you read and understand our Die Ordering Guide before submitting your order.